Whenever you decide to finish the basement walls and ceilings of your home, you need to take into consideration a lot of thing such as whether you want to the turn the basement into one large finished area or even to segregate the area into various sections. Always decide to use the right kind of tools and techniques because if you do it the correct way, you would be able to turn the basement into a cozy area for you and your family to relax and have fun together. The most important part of finishing the basement of your house is to add walls and a ceiling to the existing foundation before decorating the basement with nice and suitable paint so that it will look nice to live in. Apart from that, you can also use the basement for normal usage such as storing safe and seasonal items or other items which is not suitable to be stored in the garage. The first thing that you need to do is to measure the basement walls and once you get the correct measurement, you can use the measurements to purchase your insulation. It is recommended that you use at least two-inch thick sheets of polystyrene for finishing your basement walls because the material works well and suitable for the basement area. Take the polystyrene sheets and apply foam board adhesive onto the back of your polystyrene sheets before you start to press it into place. You have to continue adding insulation sheets onto your basement walls. Make sure that you managed to cover all area of the walls. Next step that you need to do is to attach horizontal 1-by-3-inch boards onto the wall by using 4-inch spring spikes. If you have an 8-foot wall, it is recommended that you use at least five boards which are spaced equally apart. At every 20 inches you need to drill at least 5-inch holes through the boards and the insulation. Then, you can start to install the spikes using a hammer. After that, you have to add vertical 1-by-3-inch boards at every 16 inches before connecting them to the horizontal boards. You can use drywall screws to connect them onto the horizontal boards. Drywalls is suitable for you to use in your basement because it helps you create a cozy and comfortable of warm area because it not only provide a nice setting for your basement but also maintain the warmth feel within the basement area. Next, you have to install the wall boards onto the boards with drywall screws in order to complete your finished walls. 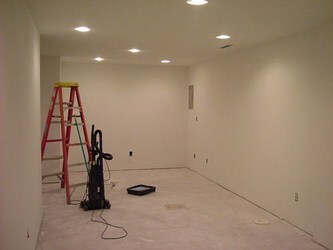 Another alternative that you can apply is by using wallpapers for finishing basement walls. Wallpapers are normally available in various patterns and colors where you can choose your favorite design to suit the décor of your basement area. Besides that, you can also add curtains onto one of your painted walls. You can either use netted, transparent or dark curtains to the wall that extends from the bottom of the floor up to the ceiling. Apart from becoming partition especially for large basement, it also provides the look of extra height to the basement area. As for the ceiling, you need to install batts of insulation between the joists in your basement ceiling. Make sure that the insulation to the joists is secured with a staple gun. You have to staple them right at the base of the joists and through the paper-faced side of your insulation. Drop Ceiling is one of the options that you can use if your basement is quite deep. Apart from the cost which is inexpensive, it is also an excellent solution due to its easy installation, along with variety of different colors and design for you to choose from. It is offers you with easy access to wires and pipes that you might have on your basement ceiling. Then, take the measurement of the total ceiling area that needed coverage. Once you managed to get the measurement, it will definitely help you in figuring out the total 1.5-inch drywall needed for the task. Take the drywall nails so that you can attach the drywall directly to the joists located in your basement ceiling in order to complete the task. Always remember that whenever you want to finish basement walls and ceilings you can also use simple ideas that can create a comfortable living setting within the basement areas. One of the ideas that you can use is by painting the basement ceiling with bright colored spray paint which is easy to apply and it do not hinder you from accessing your existing pipes and wires. You can also use concrete paint with solid color to provide a variety kind of looks to the basement walls or even mix and match the colors in order to have a marbled effect. Apart from that, painting the concrete walls in the basement would also help waterproof the walls of your basement. Area rugs can also be used by attaching them to the walls as well as hanging them onto your ceiling. It is a unique way of finishing your basement area and you can choose different patterns or designs in order to have a more unique décor style for your basement. However, you need to make sure that the rugs are not placed in areas where moisture collects so that you can prevent mold and mildew from growing in your basement. This entry was posted in Home Improvement on November 30, 2011 by Mike.